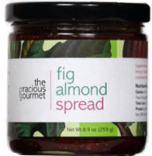 dried figs, brown sugar, water, fig puree, red wine vinegar, almonds, orange juice concentrate, lemon peel, lime puree, lemon juice concentrate, dried orange peel, almond extract. Contains tree nuts(almonds). Naturally Gluten Free. Vegan.